This is a 2 Bedroom apartment on the 24th floor. It is south-east facing and has views towards Tokyo Midtown, Hinokicho Park and Tokyo Tower. 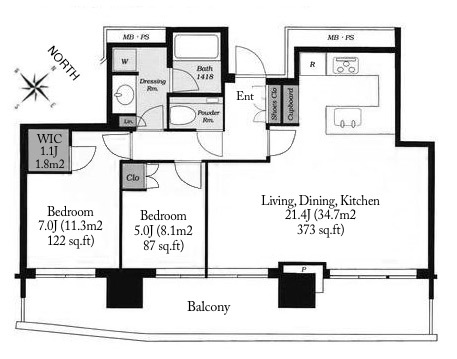 It includes a full-width balcony, open-plan kitchen, master bedroom with walk-in closet, and wood flooring. This was originally designed to be a 3-Bedroom layout but a larger living/dining room was chosen instead of a third bedroom. The apartment has never been occupied.